For the last few years If This Then That (IFTTT) has been the place to go if you wanted to customize your web experience. It was a simple way to make complex interactions between web services a reality. But now, the five-year-old company has launched three new apps and changed the name of its original app to reflect its evolving goal to make those same online interactions even more simple. In the process it thinks it may have even found a piece of its monetization strategy. On Thursday IFTTT is launching three new apps for iOS and Android that will let people push a button on their phones to make something happen. There’s the Do Button, which let’s you press a button to trigger an action that can be as simple as turning of a light or as complicated as posting your current location to your Twitter bio. My current Do button apps allow me to turn off my Hue light in my bedside table lamp, tell my team on Slack that I’m going to be away from keyboard for a while and track how many glasses of water I’ve drunk using Numerous. 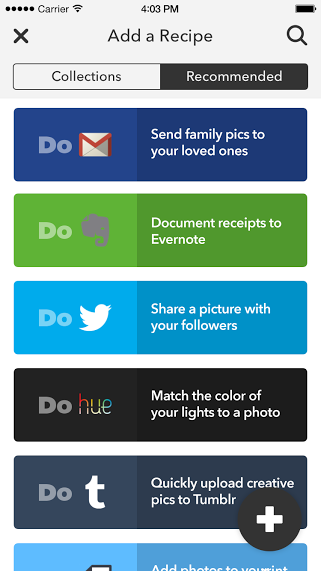 In addition to the Do Button are two other Do apps: Do Camera and Do Note. Do Camera lets you link your phone’s camera to other web services so any picture you take with the recipe gets uploaded to that service. I have one that sends pictures to Dropbox, one for Twitter and one to my email. Do Note lets you create Calendar entries, send tweets, emails or other text-based notes to services. I have one for tracking gift ideas, one for logging food to an activity tracker and one that’s empty. In each app you only get three recipes. (You can search through a list of established recipes or build your own). In playing with the Do Button I’ve found about a 3-to-4-second delay between hitting the button and the physical action happening. This may be fine for turning my thermostat down or posting to Slack, but it’s annoying for my lights. Setting up new channels is easy and even if you’ve never used the original IFTTT service you’d probably find value in it. Even my husband thought it was pretty neat. Like Twitter, the Do family of apps are deceptively easy to use, but also incredibly versatile. I’ve long loved IFTTT because it makes the kind of links I’ve longed for on the web easier to implement (remember the pain of trying to use Yahoo Pipes? ), but for many mainstream consumers it’s still too complicated. With Do, linking two services becomes almost as easy as clicking two buttons. In an interview, IFTTT CEO Linden Tibbets said he could envision a Do button being built into web platforms much like we have Twitter and Facebook buttons today. I can see it, because it’s a powerful thing to be able to easily automate actions between two services you use all the time. A command as simple as “every time I take a photo upload it to Dropbox” can take several clicks to set up today on your mobile phone, and you may not actually want all your photos to automatically upload. With Do Camera you can just take a picture from the app using the Dropbox recipe and it’s automatically saved there. As part of the transition from being a one-app company to now having four, IFTTT is changing the name of its original app to If. The app itself stays the same, but after talking with Tibbets my expectation is that we’ll see a lot more work focused around the Do family. In part that’s because that’s where the mainstream users are expected to be, but it’s also where IFTTT hopes to make its money. Speaking last year at our Structure Connect Conference Tibbets explained that he planned to monetize the service by charging consumers. Tibbets didn’t offer specifics during our chat about Do, but he did offer hints. For example, the Do apps are limited to only three recipes right now, but users might pay for more, Tibbets suggested. Meanwhile, the If app becomes the back end of the Do family and has become a lot more powerful as a platform. After having raised $30 million IFTTT has managed to open up the If app to other companies so they can build their own If channels. Previously, If developers had to take on the task themselves, making it tough to scale the company and the channels it supported very quickly. But now it has over 120 channels according to Tibbets and some of the early companies for whom IFTTT engineers built channelsare actually now being taken over and supported by the companies themselves. With the launch of these apps, IFTTT has seen that as we spend more of our lives online we don’t have a lot of great user interfaces to help us bridge different apps or offline and online services. The app model requires too many swipes, taps and touches to let us do what we want, and the physical interaction of pressing a button is still too dumb for software. Do combines the two and eliminates as many clicks as possible. Will consumers find that compelling enough to pay for it?